With Denny’s return to Britain, he was in fine voice, perhaps better than ever. Certainly he was at the pinnacle of his vocal abilities. He was to make some more fine recordings with the Stanley Black Orchestra during 1949. He quickly set about organising new engagements, and some more touring, and some radio work. He remained under contract to Decca, and he was able to get by and make a living. Such comments may perhaps be a little unfair, and Denny did make regular radio appearances. Whatever the reasons however, he was never to achieve a series of his own. 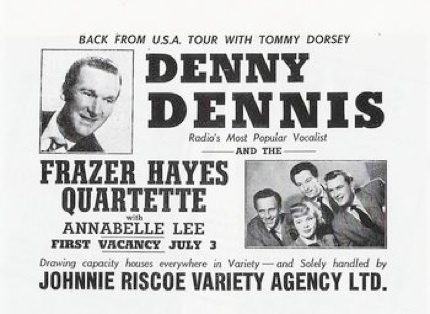 Denny then teamed up with a new quartet called the ‘Fraser Hayes Quartet’, who eventually became the ‘Fraser Hayes Four’. Denny initially financed the venture, and the new group was to prove successful. In June 1950 they appeared on the radio show ‘Variety Fanfare’, and were given positive comments by the critics. However, in January 1951 Denny left the group. This was possibly in part due to financial pressures of maintaining such a group. Denny then teamed up for a very successful association with his old Ambrose colleague Sid Phillips, and made some twenty three recordings with Sid’s very popular band, plus regularly appearing on broadcasts and touring with the band. Denny’s time with Phillips drew many favourable comments. However, from the mid 1950’s Denny found it more difficult to sustain the levels of success that he had known in his earlier career. He was not getting the work or the titles, and he made fewer recordings. 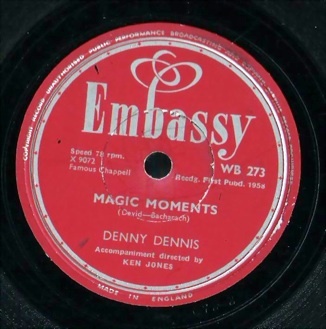 Between 1956 and 1958 Denny went on to record some twenty-one titles for the ‘Embassy’ label, mainly with the Ken Jones and Johnny Gregory Orchestras. These records could be purchased in the Woolworth’s department stores, at lower prices than the hit recordings made by the original performer. Denny recorded titles such as Como’s ‘Magic Moments, Dean Martin’s ‘Memories Are Made Of This’ and the Everly Brothers ‘Bye Bye Love’. With hindsight, it may be seen as something of a comedown for Denny, but it was not always perceived that way in the 1950’s when several versions of a song might all be in the charts at once. The ‘Embassy’ recordings were to be Denny’s last recordings. What might explain Denny’s sudden reversal in fortune? He was not the only one to experience it. Other great British and American vocalists also found it difficult to survive and the early to mid 1950’s were a difficult time for many of the established vocalists. Many of the older vocalists of the 1930’s and 1940’s had to literally reinvent themselves to succeed. Sinatra teamed up with the likes of Billy May and Nelson Riddle to produce a series of wonderful concept albums. Perry Como continued his success with more novelty type material such as ‘Hot Diggity’, Dog Diggity Boom’ and Denny’s friend Frankie Laine, while not entirely abandoning his jazz roots, eventually entered the ballad world of the western theme with hits such as ‘High Noon’. Perhaps Denny had become associated with being the voice of the 1930’s, the ‘Depression’ years, and as the crooner of the austere and wartime 1940’s and the still rationed Britain of the early 1950’s. By 1954 there was a new and emerging affluence, the public were in a mood for newness and change. Macmillan was to quip of the 1950’s at the end of the decade: “You Never had it so good”. Sadly, for the career of Denny Dennis, this was to be far from the case. Newer and younger popular singers came along, with perhaps slightly newer styles. Dickie Valentine, Petula Clark, Alma Cogan, (with whom Denny recorded a duet while with Sid Phillips, entitled ‘If’n’), Malcolm Vaughan, Eddie Fisher, Pat Boone, Andy Williams, Johnny Mathis, Michael Holliday, and eventually Mat Monro and Jack Jones, who achieved much success in the 1960’s. Who but the public can say why singers within similar styles either prosper or find things more difficult? Certainly Denny was a natural to be handling many of the 1950’s titles in his own right. Ultimately Rock ‘n’ Roll was to herald quite radical musical changes. The Bill Haley and His Comets number, ‘Rock Around The Clock’ indicated that musical change was in the air by 1954. With the advent of the highly visual and energy charged Elvis Presley in 1956, the age of ‘Rock’ had arrived. Ironically, it was to be on Tommy and Jimmy Dorsey’s TV shows that the gyrating Mr. Presley first came to public notice. The age of ‘Rock’ is still with us today, as it continually and successfully reinvents itself to each successive generation. But at the time, for the likes of Denny Dennis, it spelt something of a disaster. Denny continued to work, but it was rapidly becoming more difficult to find. From 1957 onwards, Denny discovered the Northern ‘Club’ scene, and this was eventually to provide a lot of regular work. In 1957 Denny joined his old friend Len Marten on a tour entitled ‘Television Highlights of 1957’, billed as ‘Radio and TV’s favourite vocalist’. Following this, Denny found himself on tour again in a variety show called ‘Disc Doubles’. This package show employed a lot of young and hopeful performers who were to impersonate the big stars. Sadly, Denny was there to impersonate non other than Bing Crosby, the very performer he had worked so hard to avoid comparisons with. One of the performers, Dean Perelli, (Impersonating Mario Lanza) and who under the name of Guiseppe Perelli was to go on to a successful career in opera, commented, “Everybody respected Denny, and he should never have been in the show in the first place. He should have been out on his own topping the bill”. Some critics of the show commented that Denny was in fine voice and did a good impression of Crosby, while others commented that Denny reached and sustained notes that Crosby could never reach. In a series of interviews at the time, Denny commented on the show. For Denny, who had always strived so hard and cared so much about developing his own style and crafting a lyric, it was a very low point in his career. It was also a period in Denny’s life where personal financial and family circumstances were most profound. Quite literally, Denny had no option but to keep working. Above all Denny retained his dignity, but the tension between staying in work, and staying true to himself as an artist must have been difficult to bear. Denny finally gave up on London, and took a more permanent post at the ‘Owl Country Club’ in Hambleton, near Selby in Yorkshire, as vocalist compere and entertainments manager. The club was a successful and large one, which would regularly employ the big names of the day for a week’s engagement at a time. Denny was to introduce many of them. Dickie Valentine, Johnny Ray, Lita Roza, Shirley Bassey, Ronnie Carroll, The Beverley Sisters, to name but a few. Denny was to remain at the Owl Club until 1965, when after a dispute with the owner, he was asked to leave.